CANCER - the word, the struggle, the trauma, the pain sends shivers down the spine of anyone and everyone who hasn't even gone through it. Because the word sends down the signal - NO HOPE. But one woman turned her life around from this so-called NO HOPE zone to becoming an inspiration. This week I take you to meet Mumbai-based Priyanka Joshi Nair an MBA who his slowly making her mark in the blogging world. Hailing from Jaipur, Priyanka says she is among the few privileged girls who got the freedom to chase their dreams, expand their wing-span and take a flight to the heights they wish to perch at. No wonder, besides being an MBA in, Priyanka also holds a Diploma in Computers, Diploma in Export Management, B.Com and has also recently done Digital Marketing Basics. She had over six years of experience in various fields including Industrial and educational field. In 2011 Priyanka wed the man of her choice from down South India. She says that she didn't get accepted by her husband's family, but since she had her husband's love and support by her side, it prevented her from breaking down. And then the birth of her daughter in 2013 came as a happy, yet a big turning point in her life. A bittersweet experience shared in her own words, "I took maternity break after my baby girl was born, usually, we get it for three months in but as I was an old employee I was granted almost one-year maternity break, during that period I asked my Mother-In-Law to stay back so that I could continue the job but she refused and I had to quit; that was the best job of my career and I was performing really well." "I was diagnosed with a worse kind of TB. Besides I had some 18 tumors all inside my abdomen area, especially near my food pipe and liver. I could hardly talk, I used to faint, always had a fever, breathlessness. But I was blessed that I was diagnosed at a very early stage and started my treatment which lasted for 11 months. My baby was three-years-old at that time. Only my husband, parents stood by me, none else. I remember the days when my daughter would cry seeing me unresponsive and also the days when I would hide my pain behind Kajal, Lipstick and other make-up to look normal to her." Priyanka says that this journey through cancer was the turning point in her life. "Mahima, at one point, I was undergoing treatment while my husband was transferred by his company to Mumbai. I was staying at my mom's place in Indore. Neighbours use to pass snide remarks about me staying at my mother's place; about choosing to marry in the wrong family and even about my weight gain - I had put on about 15 kgs. There was no end to the mental trauma that my family and I were inflicted by neighbours. But then, I would think, do they really matter? I was restless, but somehow not hopeless. I decided to change my life from being a victim of life to be a winner from life. I identified my passion to write and decided to create my own blog. This led to my blogging journey starting December 2016, since I had decided a New Year has to bring me to a New Start," recalls Priyanka. And today she has more than a 100 blogs to her credit on her own website. Her pen name is VIRTUAL SIYAHI (meaning virtual ink) while she writes umpteen posts on Self Help and Mental Health Awareness. And has lost count of others contributed to different websites across India. Some of these have been awarded as well. "Yes 150 to be precise Mahima, I just checked while talking to you. Yes, you may call me a pen-freak, writing is cathartic. My daughter is my biggest motivation, she sits beside me most of the times, she also asks me how many likes did you get today on your blogs? Priyanka laughs again and adds, "My husband is also being very supportive." But Priyanka hasn't stopped here. She has continued to invest in herself, "I decided to upgrade myself and learnt SEO beginning level online, got certified and started writing as per best SEO practices, preferred staying original and raw. My passion became my purpose and now I will take it further." In October 2018 she came across SHEROES through social media and shared her very first article. Later she also won a badge of honour for a writing prompt #irefusetoquit in the Aspiring Writers Community of which I am a very active member. She tells me on phone," I was not aware of how to go about SHEROES, but I still took part in #irefusetoquit Challenge. 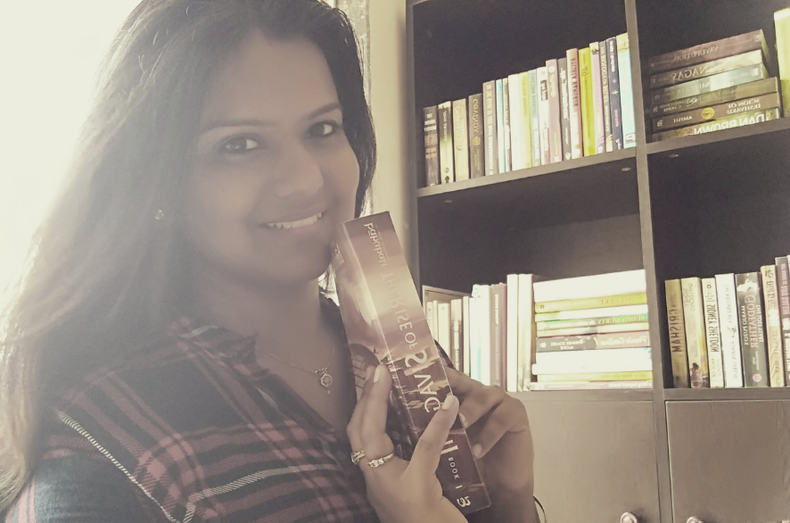 After that, I forgot about it, but Ms. Nidhi Thawal took so much effort to connect with me to let me know that I have won and sent me my gift which was a wonderful book! At SHEROES I feel at home. "At SHEROES, I feel loved, cared and welcomed all the time. My writing skills are appreciated here. And a little appreciation can do great wonders-- not many know about this. SHEROES has given me that much-needed confidence and also strengthened my will to keep going strong as a blogger." Today she is a celebrated member of the SHEROES ASPIRING WRITERS' COMMUNITY. So what next Priyanka? Pat comes the reply, "I want to get into Entrepreneurship, I already call myself SOLO-PRENEUR. Writing and reading have changed me a lot and I want to take it to the next level. I am designing my own products which will take a few months, I do have a vision. And I will share the updates with you at the right time. All I know for now is that I wish to give my daughter the best life of her dreams. And for that, I am pretty focused." "We need to change, we need to lift another women up instead of pulling her down; we need to stay strong for things we believe in, real power comes from within and we need to take charge. Let nothing stop us from achieving our dreams. Let nothing effect your internal peace, take control of your inner-self. Swami Vivekananda once said - Arise, Awake and Stop for Nothing. So women, remember - Patience and Perseverance is the Key." So if #HerStory has touched your heart, do share it will others. And don't forget to follow Priyanka on SHEROES. Additionally read about this woman Coming Out Of The Cancer Closet. Thank you @Uma Krithi ji and @Satyavathi Arunkumar ji...It means a lot 🌸.. When we decide to move ahead in life,we definetely reach somewhere. Dear Priyanka,You have shown that all odds could be defined by persistent efforts. Kudos to you, you are a great inspiration for the budding writers here. And Sheroes is synonymous to confidence booster. I can't thank SHEROES enough. I feel overwhelmed while reading this, is this me? I managed to reach till here and with such wonderful people around me in this community I am sure, I will keep moving ahead. I express my sincere and heartfelt gratitude to @Mahima Sharma ji and a very special thanks to @Sairee Chahal ma'am who gave us this amazing platform to showcase our hidden skills and gave us the power to be ourself. No words only loads of love towards Sheroes and Priyanka.